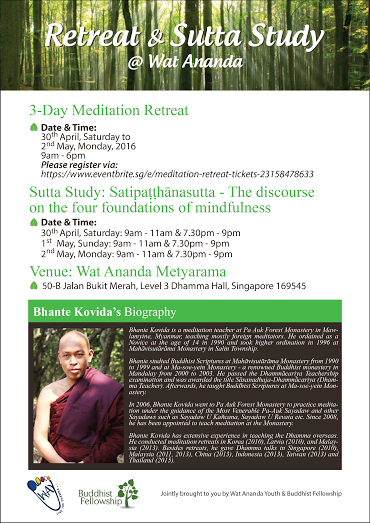 In the coming month of June, Luang Por Anek will be here in Singapore for a short Dhamma Tour together with Ajahn Preechar, Ajahn Somjit, Ajahn Dton, Ajahn Bunkhanong, Ajahn Cagino, Ajahn Tanee and Phra Phamornpol. For detailed information regarding about his tour schedule, do refer to the poster below for clarification. Luang Por Anek Yasadinno, the abbot of Wat Pah Sai Ngam was born in 1946 in Det Udom District, Ubon province, Thailand. Luang Por Anek received ordination as a Buddhist monk on June 5, 1967 at his local village monastery. In 1968, he moved to Wat Nong Pah Pong and practiced under the tutelage of Luang Por Chah Subhaddo. After training himself for many years under the guidance of Luang Por Chah, he was eventually entrusted with the position of abbot of Wat Pah Sai Ngam which he built from ground up and where he has lived from its very first day until now. Since 1991, Luang Por Anek has established many social welfare projects in Thailand. Some of their projects include: buffalo and cow welfare fund; community welfare Dhamma Compassion fund and Sangha medical fund. There will only be one meal for the venerables. Please arrive at the respective location by 8.15am to prepare your food offerings. If you are bringing fruits, please cut them before offering. Please contact us @ way1966@gmail.com for clarification or more information. This entry was posted in Forest Way, Uncategorized on April 29, 2016 by wayadmin. Vesak Day, which falls on 21 May this year, holds a special significance for all Buddhists as it is the day that commemorates the birth, enlightenment (nirvāna) and death (Parinirvāna) of Lord Buddha. 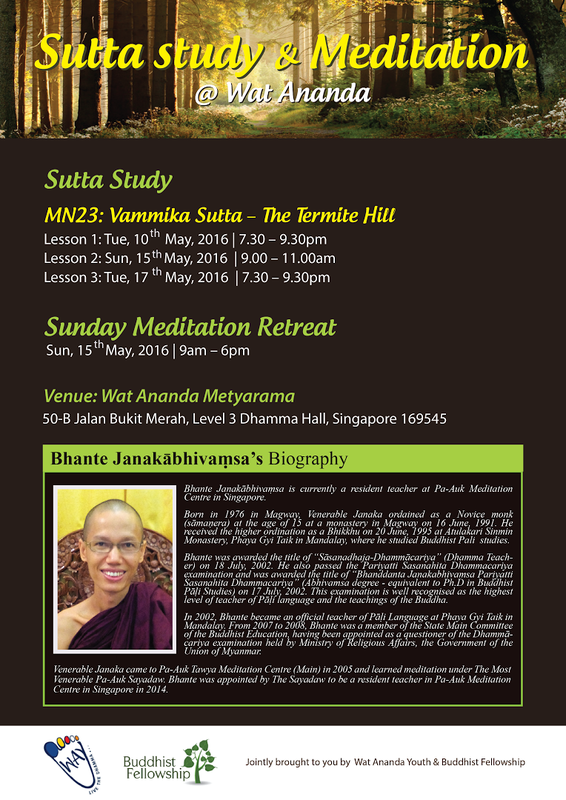 In the month of May, WAY is privileged to have 3 visiting Venerables who will be sharing and giving us precious teachings of the Dhamma over the weeks. Please find the program details of each Venerable as follow. In case you cannot view the details, posters are attached in this notice for your reference. Do visit our website http://way.org.sg/ or our Facebook page WAY Singapore for updates in case there are changes to the activities. Last but not least, Happy Vesak from all of us at WAY. Wishing you peace and happiness always. This entry was posted in Forest Way on April 22, 2016 by wayadmin. Lunch dana to the Sangha is at 11.15am. If you wish to offer lunch dana, please bring along some food and be at the dining hall by 10.45am. This entry was posted in Sunday Morning Service (SMS), Uncategorized on April 3, 2016 by wayadmin.